Remember to get method return value, and return the value. Spring IoC container can autowire relationships between beans. Since owner's property name is "dog", Spring will look for bean with id "dog"
More than 1 bean with the same type/child to wire will cause error. It will pick the constructor. The picking rule is look for the constructor with the most parameters. So normally we do primary="false" to those are not first choice. 2. autowire-candidate="false": never see this bean as auto-wire choice. Move the control of beans creation, and relationship maintenance from your code to Spring. So do not need to maintain code, just maintain applicationContext config. This is mainly done by DI in spring. All instances will be purged when session closed. Stay with SessionFactory, so it's longer than 1st Level. Return proxy instead of target object, so load query when you call get functions. So object MUST NOT set as final. Hibernate default is lazy="true", this will cause error when you use related object when session is already closed. If set a lot lazy="false", a lot unnecessary query will run, which cause a waste. openSessionInView is better than others, since you don't know if you really loading related object or not. All we do just extend life cycle of session. 2. Hibernate.initialize during the session. 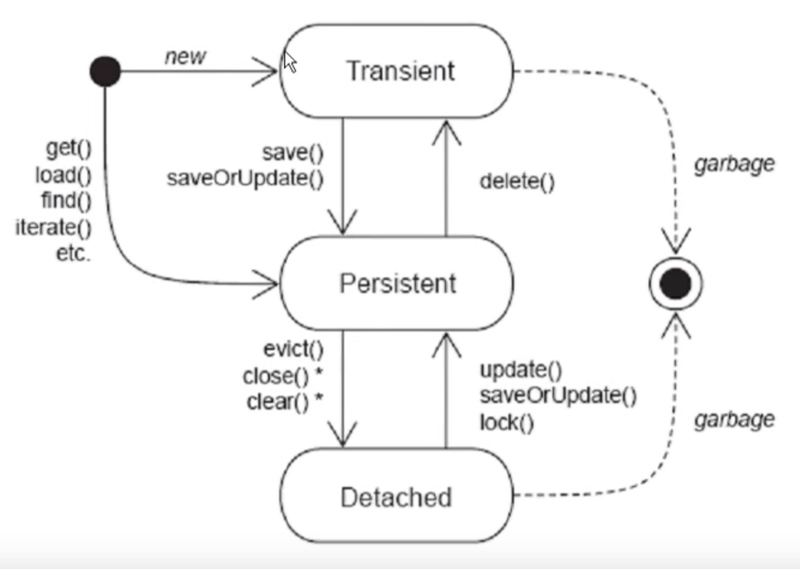 In many-to-one(many side), if set the class to lazy="false"
Hibernate will use left outer join to load related data with the original data in one time. In one-to-many(one side), if set the set to lazy="false"
Hibernate will first load the object list, then load ALL related objects from separate query for each object. Make the query session alive, starts from the web filter, until jump out from the web filter. All hibernate usage then REQUIRED to use getCurrentSession! This will make session stay open for longer time. hard to know when to pre-load, and when to not-pre-load. Auto delete students when delete a department. Auto add/update students when save a department. Two tables, A and B. B's foreign id is A's id. simply use <many-to-one> and set unique="true"
Issue: in lazy mode, after session closed, the foreign property still not load. In <set>: If we want automatically save each record in <set> property, use cascade="save-update"
If exceed scope, JVM will do garbage collection. Normally to be the object has been created but not related to any session nor db record. If persistent state object changes, the db record will be changed when transaction commited. //"from Student" default as "select *"
//Also can do query like distinct, between and, in(), count,avg, having,max,min,sum etc..
from Student where name like "%Cat%"